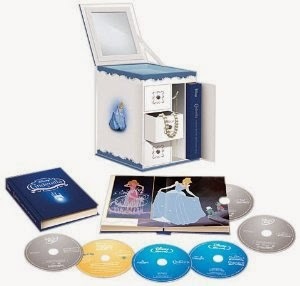 Amazon has the Cinderella Trilogy 6-Disc Combo Pack with Limited Edition Collectible Jewelry Box for only $39.99 shipped (reg. $89.99)! This would make a wonderful Christmas gift for an Cinderella fan. Rediscover the memorable music, beloved characters, and magical story of the Disney Princess who taught us that dreams really do come true in the Cinderella 3-Movie Collection Jewelry Box Set. This 6-disc set includes Disney’s Cinderella, Cinderella II: Dreams Come True, and Cinderella III: Twist in Time on Blu-ray and DVD as well as a Digital Copy of Cinderella that allows you to watch Disney’s timeless fairytale classic wherever and whenever you want. All 6 discs are contained in a Cinderella Picture Storybook that fits perfectly inside a beautifully crafted jewelry box. Share the Cinderella 3-Movie Collection Jewelry Box Set with the princess in your life today and create memories that last a lifetime.